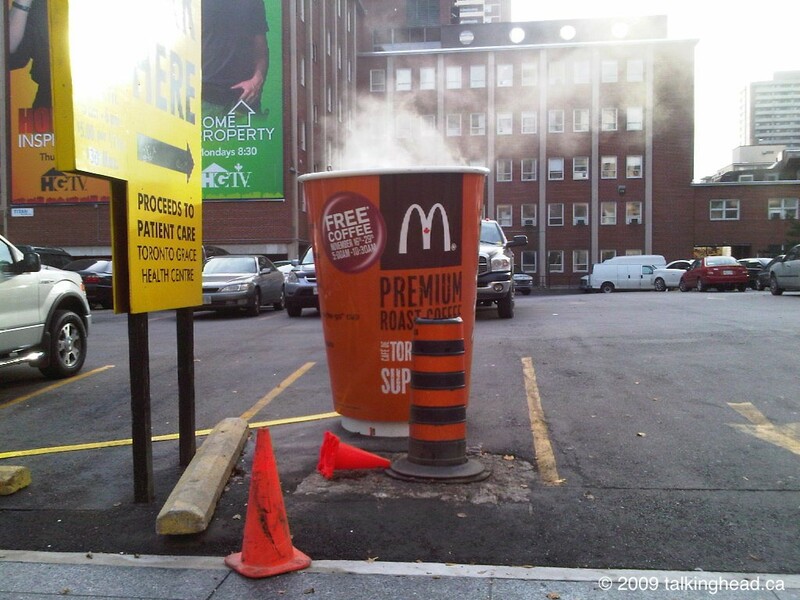 I was walking along Bloor Street this morning; I noticed in the distance a giant steaming coffee cup. When I got closer, I noticed a decal on the cup indicating that McDonald’s will be giving away free coffee November 16th-29th between 5:30 and 10:30 AM (breakfast hours). Given the highly localized marketing effort, let’s presume this offer is only valid at locations in Downtown Toronto until we hear otherwise. Perhaps more advertising will appear closer to the launch date for the offer. I’m sure the intent of this advertisement was to generate word of mouth which means that I’m falling prey to their marketing objectives by posting this. I also appreciate clever advertising when I see it. Walking past a well-branded steaming cup of coffee early in the morning is a pretty easy message to absorb, even if you’re a zombie like me in the mornings. The last time McDonald’s ran a free coffee campaign, it actually worked on me. Sometimes I now get coffee with a breakfast meal instead of milk or juice. I normally would not have ordered coffee at McDonald’s but the freebie gave me a chance to try it. It’s not bad. I prefer McDonald’s coffee to Tim Horton’s. * Notable Exception: During the Christmas season, Starbucks Peppermint Mocha is absolutely irresistible. This entry was posted on Tuesday, November 10th, 2009 at 23:44 -0500 and is filed under marketing, Toronto. You can follow any responses to this entry through the RSS 2.0 feed. You can leave a response, or trackback from your own site.